Gabions are double twisted hexagonal woven galvanized steel wire mesh compartmented baskets with a rectangular boxshape. The compartments or cells are of equal size and dimension and are formed by internal diaphragms being placed within the basket. The compartments or cells are filled with natural stone and the diaphragms minimize stone migration within the basket providing even distribution of the stone fill throughout the basket even after structural movement. Open the bundle and unfold each unit. Lift the sides, the ends and the diaphragms of each unit into vertical position. Attach the sides of four corners together with locking wire fastener or lacing wire and the diaphragms to the front and back of the gabion. Empty gabion baskets shall be assembled individually and placed on the approved surface to the lines and grades as shown or as directed, with the position of all creases and that the tops of all sides are level. All gabion baskets shall be properly staggered horizontally and vertically as shown in the construction drawings. Finished gabion structures shall have no gaps along the perimeter of the contact surfaces between adjoining units. All adjoining empty gabion units shall be connected along the perimeter of their contact surfaces in order to obtain a monolithic structure. All lacing wire terminals shall be securely fastened. All joining shall be made through selvedge-selvedge or selvedge-edge wire connection; mesh-mesh wire connection is prohibited except in the case where baskets are offset or stacked and selvedge-mesh or mesh-mesh wire connection would be necessary. As a minimum, a fastener shall be installed at each mesh opening at the location where mesh wire meets selvedge or edge wire. The initial line of gabion basket units shall be placed on the prepared filter layer surface and adjoining empty baskets set to line and grade, and common sides with adjacent units thoroughly laced or fastened. They shall be placed in a manner to remove any kinks or bends in the mesh and to uniform alignment. The basket units then shall be partially filled to provide anchorage against deformation and displacement during the filling operation. The stone shall be placed in the units as specified or directed by the manufacturer. Deformation and bulging of the gabion units, especially on the wall face, shall be corrected prior to additional stone filling. Care shall be taken, when placing the stone by hand or machine, to assure that the PVC coating on the gabions will not be damaged if PVC is utilized. All stone on the exposed face shall be hand placed to ensure a neat compact appearance. Gabions shall be uniformly overfilled by about 1-3 inches to account for future structural settlements and for additional layers. Gabions can be filled by any kind of earth filling equipment. The maximum height from which the stones may be dropped into the baskets shall be 3'. When excavation and foundation preparation are completed, the pre-assembled gabions shall be placed in their proper location according to the plans provided. Gabions shall then be connected together and aligned prior to filling with stone. The stone fill shall have a gradation as listed or specified within the contract specifications or as listed within this specification. The stone fill shall be placed into the gabion units in 1' lifts. Cells shall be filled to a depth not exceeding 1' at a time. The fill layer should never be more than 1' higher then any adjoining cell. Connecting wires shall be installed from the front to back and side to side of the individual cells at each 1' vertical interval for gabions with a depth of 3'. The voids shall be minimized by using well graded stone fill and by hand placement of the facing in order to achieve a dense, compact stone fill. All corners shall be securely connected to the adjoining basket of the same layer before filing the units. When more than one layer of gabions is required, in order for the individual units to become incorporated into one continuous structure, the next layer of gabions shall be connected to the layer underneath after this layer has been securely closed. Gabions shall be uniformly overfilled by about 1-2 inches to account for structural settlement. 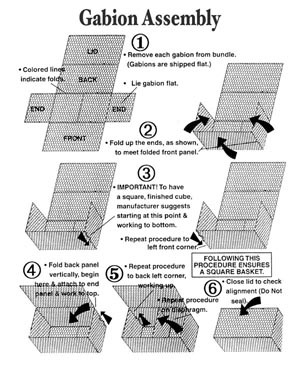 The lids of the gabion units shall be tightly secured along all edges, ends and diaphragms in the same manner as described for assembling. Adjacent lids may be securely attached at the same time. The panel edges shall be pulled to be connected using the appropriate closing tools where necessary. Single point leverage tools, such as crowbars will not be acceptable. All end wire shall then be turned in.